Complete the following quotation form with information about your print job. We quote work on the most common paper types and finishes which may differ based on the final requirements. Quotes are based on accuracy of the information we receive and may change when the artwork is submitted. For jobs that do not fit the standard criteria, enter a description in the comments box and if we have questions we will call you back. 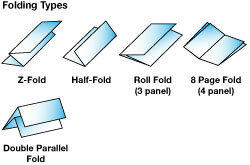 Refer to the examples shown below to determine how to fold your brochure.